We need more head to head fighting games. Actually to be exact, we need more fighting games like Soulcalibur. Since the series first started in 1995 it has defined and perfected the features of its genre. On October 19th, after 6 years of waiting since the last entry in the series, Soulcalibur 6 arrives. It brings with it the same great mechanics, 3 brand new characters, and much more. 7 Rock, Paper, Scissors, Reversal Edge! Fans of the series will be happy to hear that much of Soulcalibur’s carefully honed mechanics will stay the same in this newest entry. The game’s “8-Way Run” is still possible, allowing you to maneuver your character in any direction, any time you want. This system keeps the fights fluid, intuitive, and truly 3D– unlike many other fighting games. You’ll also still have the ability to claim victory by knocking your opponent out of the fighting arena! Azwel is the first of 3 brand new playable characters. This guy seems both insane, and insanely powerful– a deadly combination. Azwel is also a bit cocky as he refers to himself as the “leader of humanity”. As you’ll see in the gameplay footage above, Azwel also seems to have a taste for utterly destroying humans with his weapon “Palindrome”; a mystical energy that can transform into whatever deadly device he desires. Also known as the “Agent in Black”, Grøh is a deadly new addition to the Soulcalibur roster. Armed with a Darth Maul-like double bladed sword, Grøh’s appearance and weapon can change throughout the course of a fight. As his power grows when using Soul Charge (a special move that also leaves the player vulnerable), Grøh’s hair changes to a vibrant red, scars glow on his arm, and his weapon breaks into two deadly pieces. Grøh is also able to use shockwave type attacks and teleport! In a nod to its long lineage, the boss from the original Soulcalibur game is now a playable character in Soulcalibur 6. “Inferno”, as he’s called, wields the franchises namesake, the “Soul Edge”, and he possess the ability to mimic the powers of whoever he’s fighting against. He sounds a bit overpowered to us… Oh well, we know who we’re picking when the game releases! Have the perfect fighter in mind? Design your own in Soulcalibur 6’s character creator. You’ll even get to use the character you create in Libra of Soul, one of two single-player story modes. Check out the trailer for this mode above, and to see a glimpse of the the wide range of fighter customization available– including 16 different races! 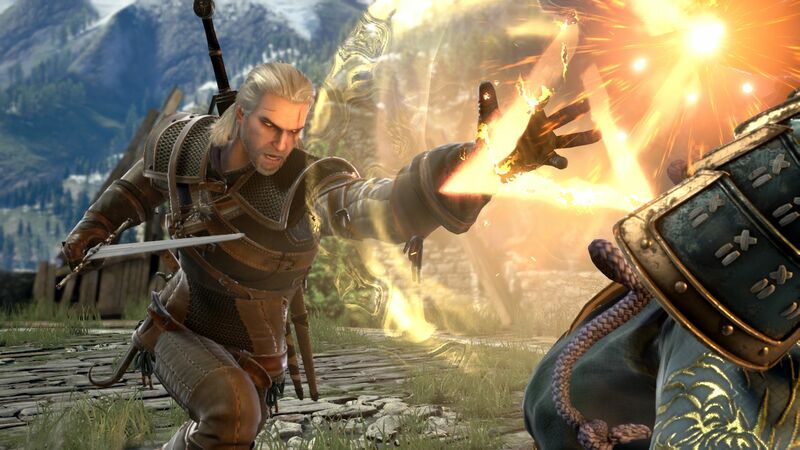 In the Libra of Soul mode you’ll go head to head against iconic Soulcalibur characters (including Geralt) as you work your way towards taking down an evil mastermind who seeks to use a powerful weapon to achieve ultimate dominion. Rock, Paper, Scissors, Reversal Edge! Used as a high damaging counter, this new game mechanic sends fighters into a temporary cinematic stand-off. You know those moments in a sword fight where the two combatants strike simultaneously, lock swords, and then either initiate a powerful counter (or receive a powerful counter directly in their heart)– that’s Reversal Edge! Which new character are you most excited about? Or are you looking forward to creating your own? Don’t forget there will also be DLC available in months to come, which will undoubtedly bring even more additions (hopefully from other fighter-game franchises like Killer Instinct) to the roster. We already know Tira from Soulcalibur 3 will be included!